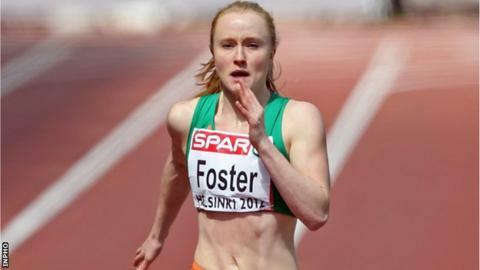 Amy Foster's joy at qualification for the European Indoors turned to disappointment as she suffered a disqualification at the Irish Championships in Athlone on Sunday. Foster booked her place in Gothenburg next month with a new 60m personal best of 7.33 in the heats on Saturday night. But Foster and Ailis McSweeney were both disqualified in Sunday's final. Both athletes protested that the reaction time readings which indicated they had jumped the gun were incorrect. However, the officials were not for budging and with defending champion Foster and McSweeney out of the field, Kelly Proper took her third title of the weekend as she won in 7.45 seconds. Another Northern Ireland athlete Jason Harvey won a rough and tumble 400m final which saw his coach Paul McKee up barged off the track around the half-distance point. 2003 world indoor bronze medallist McKee came out on the receiving end along with another faller John Houston in a typically physical indoor 400m. Harvey broke 48 seconds for the second time in a week as he clocked 47.94 which left him more than half a second ahead of Timmy Crowe. Letterkenny athlete Mark English also opened up the possibility of him being on the plane to Gothenburg as he impressively beat his club-mate Darren McBrearty to win the 800m. English, a brilliant fifth at last year's World Junior Championships, showed he has wintered well as he took victory in 1:48.44 - .06secs inside the European Indoor mark - which left him almost two seconds ahead of McBrearty. Newcastle athlete Kerry Harty ran impressively to clock an indoor 1500m personal best of 4:16.36 as she finished less than 2.5 seconds behind winner Fionnuala Britton. Britton's winning time of 4:13.96 was just inside the European Indoor standard but she will instead run the 3000m in Gothenburg. Donore athlete John Travers matched Stephen Scullion's feat of 24 hours earlier in bettering the European Indoor 3000m standard. Travers took the title in 7:58.55 although his time was .44secs slower than managed by Scullion in Birmingham on Saturday. David McCarthy clocked 7:51 in Boston on Friday night while Ciaran O'Lionaird has also achieved the 3K standard although he will surely contest the 1500m if he opts to travel to Gothenburg. Behind Travers was City of Derry's Conor Bradley who clocked 8:05.29 while Paralympic double gold medallist Michael McKillop took fifth in 8:32.57. Antrim athlete Zoe Brown secured another Irish pole vault title with a 4.22m clearance with Adam McMullan winning the men's long jump with 7.17m but there were disappointment for sprinter Dean Adams who had to pull out of the 60m semi-finals because of injury. Other notable performances includes Brian Gregan's 200m victory in 21.33 while John Coghlan, son of the chairman of the boards Eamonn Coghlan, won his first national senior title with a 1500m victory in 3:47.43 which left him over 1.5 seconds ahead of Eoin Everard. Another of Paul McKee's charges Curtis Woods was out of the medals in the 200m final as he took fourth in 22.23. With Derval O'Rourke pulling out of the Championships because of a niggle after running in Birmingham on Saturday, Sarah Lavin took the 60m hurdles gold in a new national junior record of 8.36 seconds.